Why do so many prominent people worry about runaway global warming? The fear is that, once the atmosphere has warmed past some critical level, various feedback mechanisms will kick in and push the temperature beyond the point where the planet will become inhospitable for human life. Once these feedback mechanisms have kicked in, it is unlikely that we can do anything to intervene. And considering the current signs from the environment, accelerating industrial emissions, and the long life of greenhouse gasses in the atmosphere, some worry that it may already be too late to prevent this scenario. Many processes in the natural world have continuous consequences which either accelerate or retard the original process. Such consequences feed back into the process from which they arise, and so are called "feedback loops." For example, a newly-introduced predator devours the population of its chosen prey, until the food supply is so diminished that the predator can't feed its young and its own population contracts: that's negative feedback. Balance is exceeded, and the overfeeding predators give rise to an effect that drives down their own numbers. Feedback loops occur in the social world as well; for instance, under a regressive income tax, the working poor pay plenty of tax, which tends to keep them increasingly poor and working longer hours, while the wealthy pay little or no tax, which tends to make them wealthier. That's a positive feedback loop, because the original process is exacerbated by its own effects. Our climate system is largely a system of feedback mechanisms, both positive and negative. It is the crux of the climate change skeptics' argument that negative feedback systems will cancel out industry- induced global climate change. They suggest that excess carbon in the atmosphere will be absorbed by the oceans and will stimulate photosynthesis in land-based plants, both of which will serve to remove the excess carbon from the atmosphere and lock it safely away. 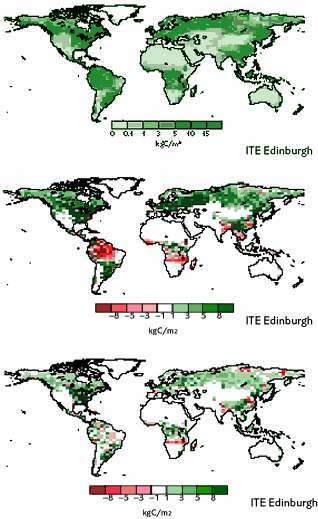 Global vegetation biomass in the 1990s (top), in the 2080s due to global climate change from unmitigated emissions (middle), and in the 2080s with emissions stabilizing CO2 at 750 ppm (bottom). Ocean waters absorb carbon dioxide from the atmosphere, holding much of it in solution, but transforming some into carbolic acid. Phytoplankton in the upper ocean layers fix the carbon dioxide in their cells through the process of photosynthesis. These Phytoplankton form the basis of the ocean food chain. They are grazed by animal plankton and other organisms, which utilize most of the carbon as an energy source but return a small portion of it to the atmosphere through respiration. Some of this carbon ultimately settles through the ocean column in the form of cast-off tests and shells, and animal feces. During periods of global warming millions of years ago, this sediment of carbon wastes formed the source for the hydrocarbon deposits which have served to power our civilization through the past century, and which are now, ironically, resulting in industry-induced climate change. Unfortunately, this oceanic carbon sink could very well break down in response to climate change. Warmer seawater is already saturated with carbon, so it absorbs less. Robust absorption of carbon requires a continuous cycling of colder, carbon-poor water upward from the ocean depths. If the global thermohaline conveyor were to fail (see Part II of this series), a dangerous drop in carbon absorption could result. The retreating ice cover will decrease the Earth's albedo, as discussed in the first part of this series, reflecting less of the sun's energy and resulting in a further warming of the Earth's surface. Evaporating melt waters could also increase the water vapor content in the lower atmosphere. Water vapor is a greenhouse gas. The result of both of these effects would be a positive feedback cycle where melting ice results in a warmer climate, which in turn leads to the melting of yet more ice. Each of these feedback mechanisms (and others not mentioned here) would have dire consequences for life on this planet. Taken together, they would reinforce each other and magnify the change in climate. But the gravest concern is that rising temperatures on this planet will lead to a venting of methane from the oceans. It is this possibility which is lamented in the above quotation from Stephen Hawking. The release of the entire balance of these pent up gases into the atmosphere is possible, but highly improbable. Dr. Hawking's scenario of an Earth superheated to match its sister planet, Venus, is unlikely. If the seas started venting methane into the atmosphere, the chances are that the process would halt before all of the sequestered methane escaped. However, just a portion of this enormous reserve of carbon, if released into the atmosphere, could render the planet uninhabitable. And while many scientists consider the possibility very remote, every day more investigators assess this scenario, shake their heads and wonder: could we already have set such an event into motion? 251 million years ago, at the end of the Permian Era, life almost entirely vanished from this planet. It is the single worst mass extinction in the history of the Earth. Fully 95% of the species extant on this planet at that time were wiped out. Only a few species of plants, animals, and likely even protozoa, survived to evolve (until the next major extinction-ecologically trivial by comparison-wiped out the dinosaurs 65 million years ago). The cause of the horrendous Permian extinction has long been a mystery, and geologists have suggested a number of possibilities, none of which quite explains the evidence. But in the last fifteen years or so, a compelling picture has emerged. Developed in response to a wealth of new paleogeological evidence from that period-evidence from petrology, geochemistry, oceanography, paleoclimatology and various other disciplines-the scenario is quickly being accepted by the scientific community. The culprit that wiped out 95% of all species and very nearly put an end to life on this planet was runaway global warming. The event began in a very spectacular fashion, with a massive volcanic eruption in Siberia that spewed out a volume of 2 million cubic kilometers of basalt, which covered an area of eastern Russia 1.6 million square kilometers in extent (roughly the size of Europe).19 Volcanic activity also vented a great deal of carbon dioxide and fine ash into the atmosphere. Gases were vented in such quantity that the average global temperature increased by approximately 6º C.20 Some 161 species became extinct as a direct result of these volcanic eruptions. The extinction rate was as high as 33%. But this was just the beginning. The temperature rise was high enough to trigger a number of positive feedback mechanisms. Most notably, there was a massive release of methane from hydrates locked into clathrates. The warming caused by the Siberian eruption was sufficient to melt the frozen gas hydrates, allowing bodies of methane to bubble up to the surface of the oceans and belch into the atmosphere. This introduction of methane then led to further warming, which in turn melted deeper methane hydrate deposits. The outgassing of methane was far in excess of the natural mechanisms which normally reduce carbon dioxide levels in the atmosphere. The planet's climate system broke down and runaway global warming continued until it reached some unknown threshold. The Permian Extinction should be widely understood as an ominous lesson in the danger of global warming. We need to pay particular attention to the temperature rise which caused these runaway feedback mechanisms to kick in: 6º C. Back in the first installment of this series on global climate change, we looked at a report from the Intergovernmental Panel on Climate Change (IPCC) which stated that the average global surface temperature will increase by between 1.4º and 5.8º C during the next century. This would compound the increase of 0.6º C that has already occurred during the past century. So, according to this report, the temperature could rise by as much as 6.4º C by the year 2100.22 And that this estimate is on the conservative side; it is possible that temperatures could increase by much more than 6.4º C.
The warning lights should be going off all over. A temperature increase of 6.4º C would put us well beyond the threshold for runaway global warming. Could mankind be gearing up to perpetrate the greatest extinction on this planet since the end of the Permian Era? The first reaction of most environmental activists to the news of peak oil is to say, "Good, we need to stop using fossil fuels anyway." It seems logical that a decline in hydrocarbon production will lead to a decline in carbon dioxide emissions. And it is likely that somewhere down the line, carbon emissions will abate simply due to the scarcity of fuel. But we will not go gently into that good night. When you learn that heating costs are going to continue increasing, and that shortages of natural gas are likely in our near future, what alternatives come to your mind for home heating? Passive solar heating? Sure, but that alone will not keep you warm on a cold winter night. Most people immediately think of wood. As heating costs go up, and as shortages put a chill on our homes, most of us are going to start burning wood (or will burn more wood, as the case may be). We will turn to biomass. Burning biomass is undoubtedly the dirtiest source of energy. As we burn wood, corn husks or cow chips to heat our homes, we will be pumping tremendous volumes of carbon into the atmosphere. And, in all probability, it is unavoidable. There are some things we can do to reduce the amount of wood we burn and so limit our contribution to global warming. Better insulation can increase efficiency. And consider the sort of wood furnace you will be using. Traditional brick fireplaces are the least efficient way to warm a house. Metal wood stoves are better, but soapstone is the best at holding heat and radiating it outward. A small load of wood is a soapstone stove can generate heat for hours. And when you are harvesting your wood, take care not to strip the forests bare. Be selective in choosing your wood. Practice coppicing (do a Google search to find out more about this ancient method of harvesting wood). Burning biomass will likely add to our global warming problem, but it is probable that coal burning will be far more harmful. As oil and natural gas production go into decline in North America, the alternative we will ultimately turn to is coal-whether we like it or not. Coal is considered to be abundant in North America, and it is cheap. Despite all the talk of a hydrogen economy, the real investment will go into stepping up coal production. In fact, the production of coal-fired power plants has already been stepped up. As of February 2004, at least 100 new coal-fired electric power plants were planned to go up in more than 36 states.23 This new growth market is currently flying below radar, because once plans for a coal-burning plant are made public, they are liable to be halted by the legislative efforts of environmentalists and neighborhood coalitions. If even half of these plants are completed, they will increase exhaust gas emissions by 120 million cubic feet per minute. All the new coal plants being proposed would add one-tenth of one percent to the world's annual carbon dioxide emissions.24 That may not seem like much, but it is certainly a move in the wrong direction. And it is only the beginning. As the production of oil and natural gas continues to slide, we will open up our coal reserves for electricity production, heating, industrial use, and to process coal into liquid transportation fuel. In the process, we will increase our exhaust emissions, rip up vast areas of land, create immense slag dumps, and pollute our waterways and groundwater. And we will require a major upgrade in our coal transportation network-that is, trucks and trains. You can expect strong efforts from industry and politicians to turn back environmental laws regulating coal production and coal burning. It will be argued that these regulations are damaging the economy. They will point to an economy choking from a constricting energy base, and they will insist that they cannot provide the energy we so desperately need with all these legal restrictions. Power outages will act to blunt the environmental sensibilities of the public. Perhaps the only salvation here lies in recent research (reported in FTW), that coal is likely to peak sometime around 2032, if not sooner.25 This will leave us a little less than 20 years of stepped up production before coal joins the list of has-beens. Then our carbon emissions really may begin to decrease. But the US is not the only country likely to turn to coal. China is also eying its large reserves of coal, as is India. If the world's two most populous countries step up their coal consumption along with the US, then the decline in petroleum and natural gas production will actually be greeted with a pronounced increase in carbon emissions. Peak oil will not be a blessing in disguise with regard to global warming. 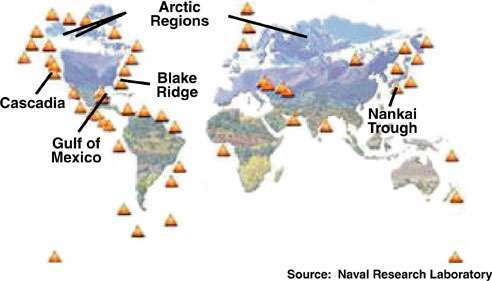 The models of global climate change developed by the IPCC and others have not taken into account the impacts of Peak Oil and the North American Natural Gas Cliff. These models are based on faulty economic projections produced by neo-classical economics-a warped discipline which is blind to resource depletion.26 If we turn to coal and biomass to make up for the decrease in oil and natural gas production, then it is likely that our actions will push the average global temperature well beyond the 6º C threshold mentioned above. The end of the oil age could very well push us into an age of runaway global warming. Coal will not be able to support the kind of energy-intensive economy which we have built on oil and natural gas. It will be a faltering effort from a civilization in denial, intent on clinging to unsustainable ways. It will fail in the end, but in this last mad burn-off of energy resources, we may very well incur the demise of life on this planet. 3 Human Race is Killing the Planet, Says Meacher, Brown, Paul. The Guardian, February 14th, 2003. 17 A Transient Rise in Tropical Sea Surface Temperature During the Paleocene-Eocene Thermal Maximum, Zachos, James C., et al. Science 28 November 2003; 302: 1551-1554. 26 Bradford Jason, personal communication.